Experience a land of natural phenomena unlike any other, where the midnight sun gives way to the colourful displays of the Northern Lights and snow-capped peaks dip down to ice-studded fjords. 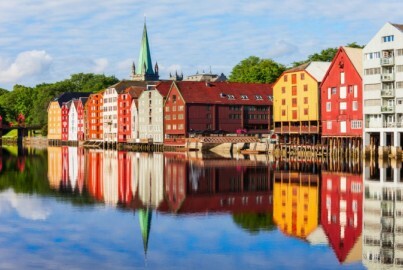 Journey through Finland, Sweden and Norway, visiting rugged islands, reindeer farms and Santa Claus Village on this dazzling 11-day tour. Depart London on your scheduled flight to Rovaniemi where you will be met by your local tour director and transferred to your hotel. Later tonight, set out for an exciting evening excursion. Travel along snowy paths under starlit skies as you search for the exquisite celestial display of the Northern Lights (applies to departures Nov-Mar only*). Alternatively, experience the breath-taking natural phenomenon of the Midnight Sun as you witness the sun shining over the horizon into the deepest hours of the night (applies to departures late May to mid-July*). This morning, embark on a unique travel experience as Siberian Huskies pull you through picturesque white landscapes to your lunchtime destination (applies to departures Dec-mid April*). 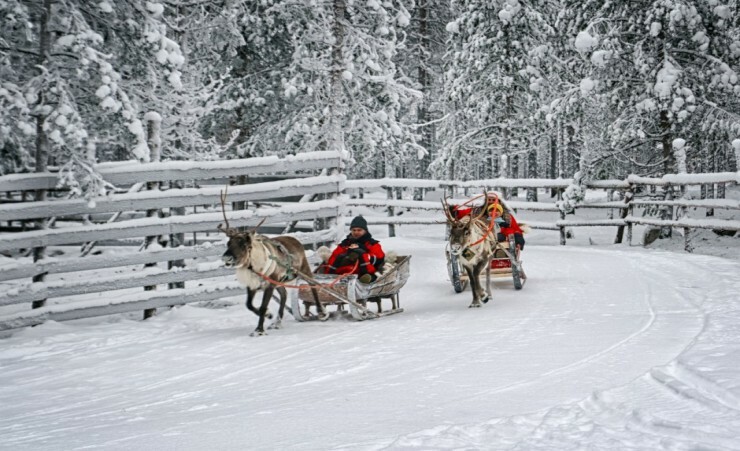 Rovaniemi is the official home of Santa Claus and a visit to the Santa Claus Village celebrates this beloved Christmas character at a theme park housing everything from his post office to elves. For tours departing late Apr-Nov, take a boat ride down the central waterway, disembarking to visit the residents of a local reindeer farm before continuing on to Santa Claus Village. Depart Rovaniemi this morning and travel to the Swedish town of Kiruna on a scenic, seven-hour coach journey through the heart of Lapland, stopping for lunch and the chance to soak in breath-taking natural landscapes. Check into your hotel in Kiruna with the remainder of the day at leisure. 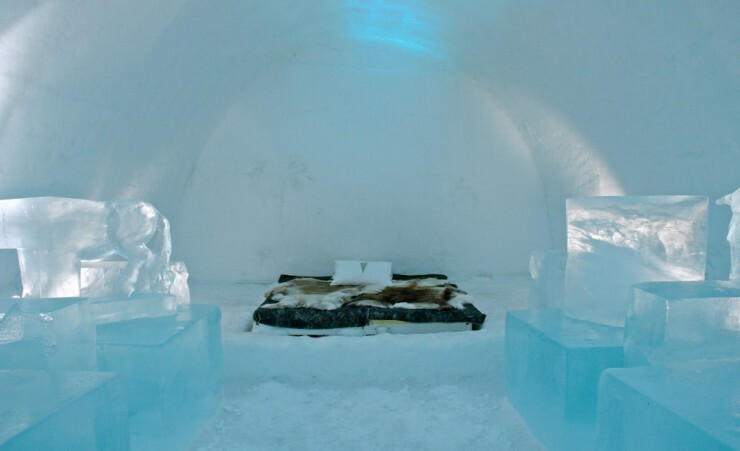 Marvel at a unique architectural wonder on this morning's tour of the nearby Ice Hotel, the world's first hotel built entirely of snow and ice. Travel onward to the nearby village of the local Sami people who have inhabited the area for centuries. Meet their herds of reindeer then relax in a traditional Sami tent while they recount age-old folktales. 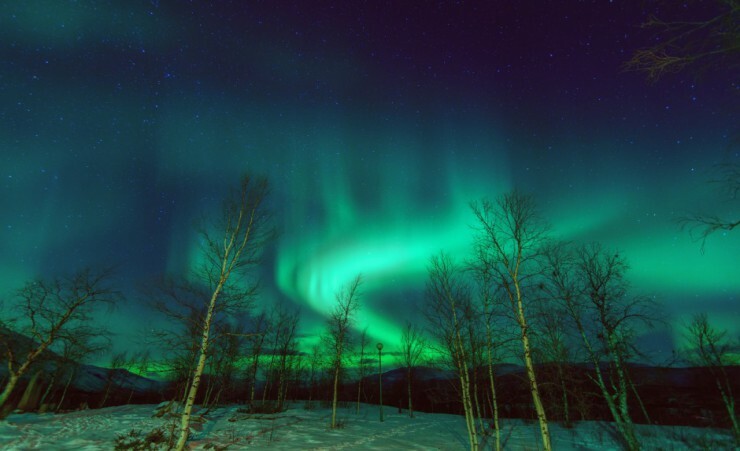 Later this evening, embark on a second Northern Lights excursion (applies to departures Nov-Mar*) or Midnight Sun outing (applies to departures late May to mid-July*) as you make the most of your spectacular natural surroundings. 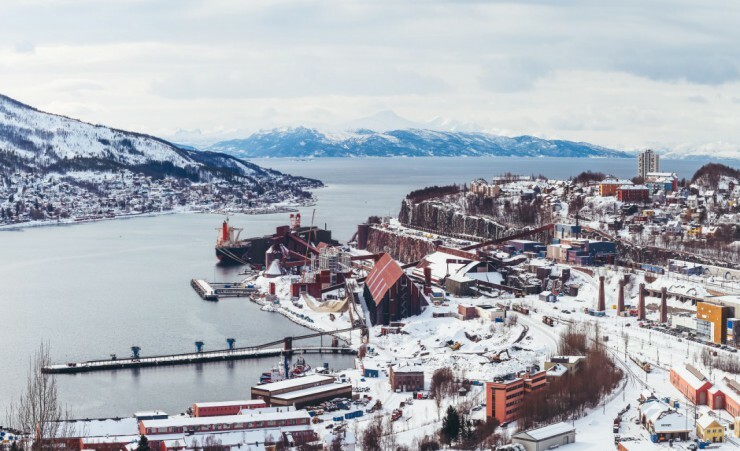 Board your train to Narvik and journey along one of the world's most northerly railway lines, the Ofoten Railway. This historic route traverses lofty mountain passes and plateaus before crossing into Norwegian Lapland. 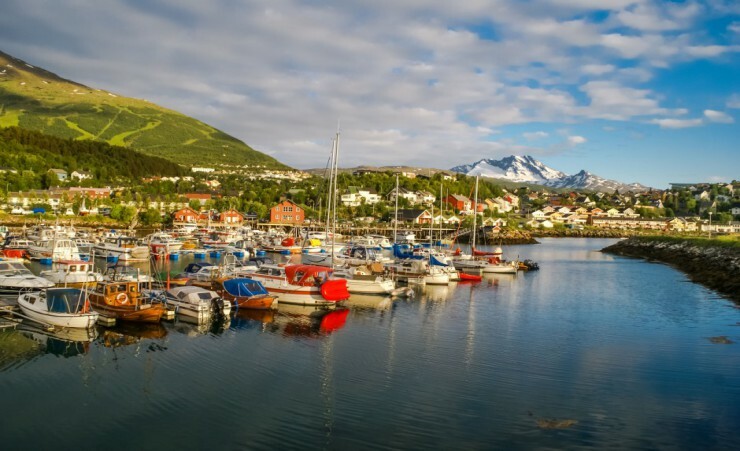 Arriving in the charming town of Narvik, a settlement that dates back to the Bronze Age, and enjoy the remainder of the day at leisure. 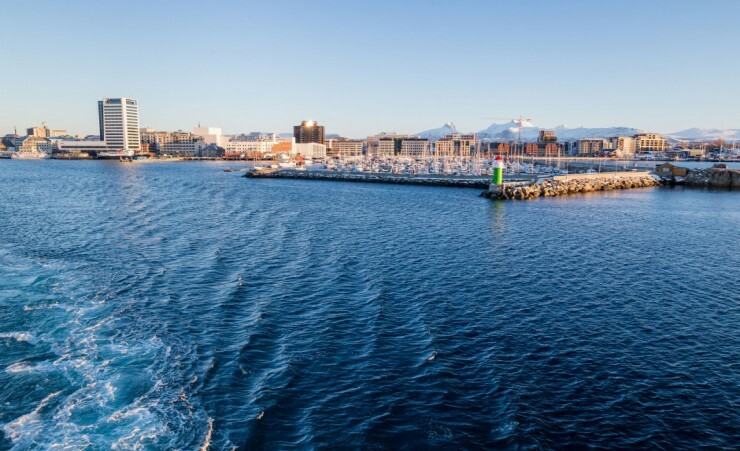 Journey past snow-capped peaks and through pine-filled valleys as you make your way by bus to Svolvaer. 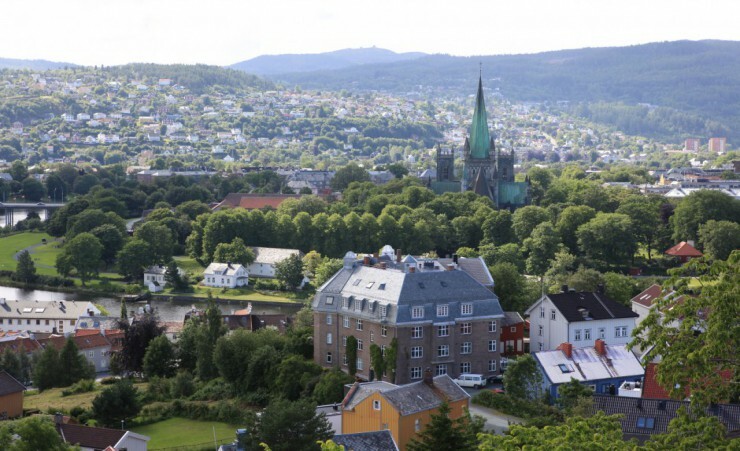 Break for lunch in picturesque surroundings before continuing onward to this port town, perched on the coastline of the Norwegian Sea, for your overnight stay. 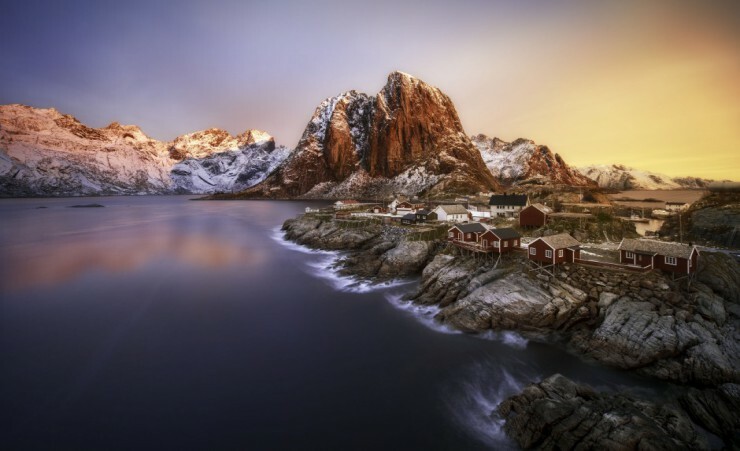 Your day is free to explore the rugged wilderness of the Lofoten Islands. Here, ice-studded fjords, windswept beaches and soaring mountains make for dazzling vistas and the islands are home to the world's densest population of sea eagles. 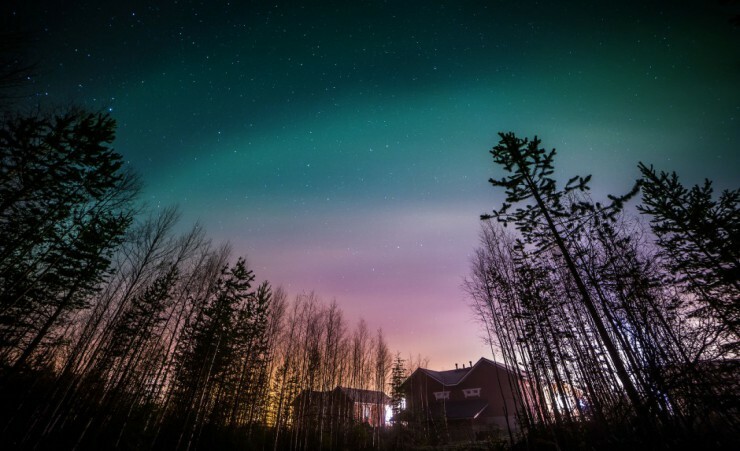 In the evening, you will journey to an untouched region of the island with hardly any light pollution as you set out on another quest for the Northern Lights (applies to departures Nov-Mar) or Midnight Sun sighting (applies to departures late May to mid-July). Journey by coach to Moskenes where you'll board a local ferry. 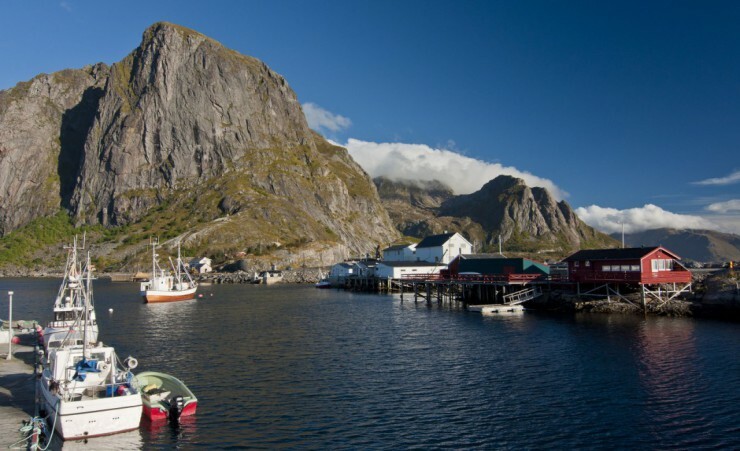 Sail past dramatic natural landscapes, jagged peaks and colourful coastal towns as you travel to beautiful Bodo, located on Norway's northernmost peninsula. A morning at leisure in Bodo allows you to stroll through the streets of this old trading post under vast, open skies. 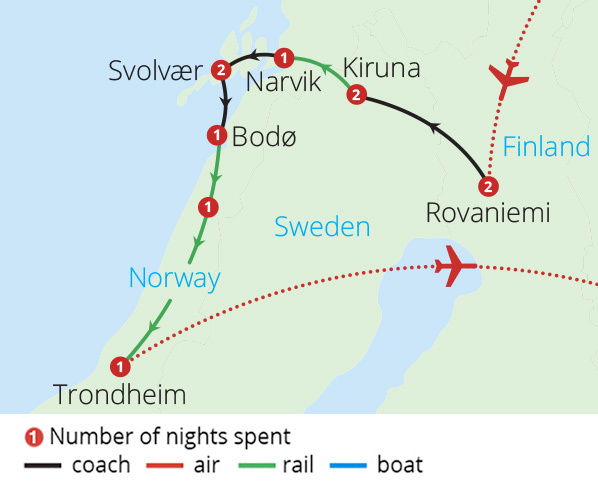 Later, board your overnight sleeper train to Trondheim, riding the Nordland Railway on what is often regarded as one of the most beautiful night-time journeys in the world. 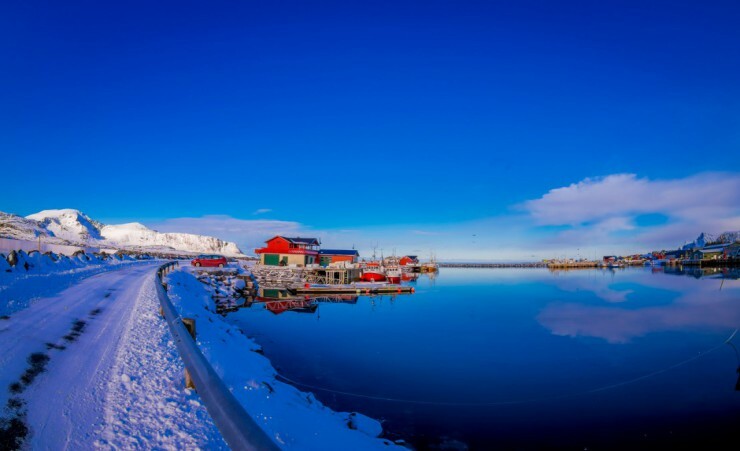 Your leisurely nine-hour journey takes you through lush farmland and dense forests before crossing into the Arctic Circle where you can admire dramatic fjords, towering mountains and winding rivers by moonlight. 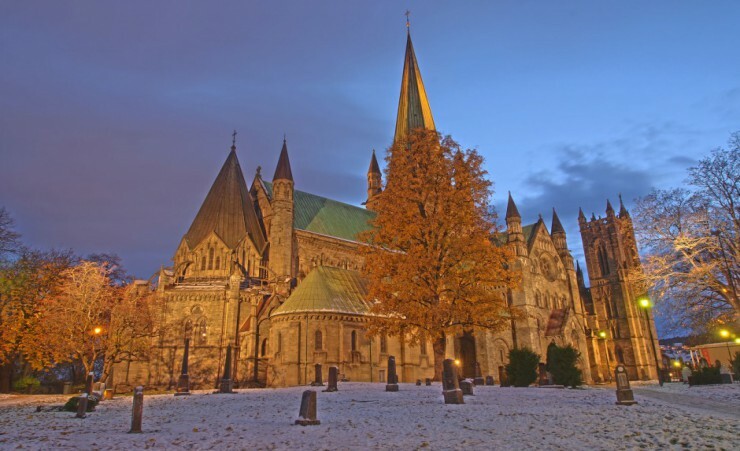 An afternoon tour of Trondheim winds through its picturesque streets, stopping at the imposing Gothic Nidaros Cathedral for a chance to explore this 11th-century structure. After an afternoon at leisure, a farewell dinner at your hotel marks the end of your tour. Your flight is to Rovaniemi Airport in Finland with Norwegian Airlines (D8), departing from London Gatwick South Terminal. Departures from 31/03/19-14/07/19 fly via Helsinki. Each passenger is entitled to 20kg of hold luggage plus 1 item of hand luggage not exceeding (max 10kg - 55x40x23cm) in size and 1 personal item such as a handbag, briefcase or laptop case. Weight restrictions will be finalized on e-ticket receipt. Should you wish to take additional luggage you will need to pay extra at check-in. Check-in should be at least 3 hours before departure. This tour is accessible to most people with an average level of fitness and normal mobility. It involves moderate days of walking on uneven paths and small hills, getting on and off coaches and trains. This tour is not suitable for anyone with walking difficulties. The minimum number of travellers in your group will be 15, and the maximum will be 30. If in the unlikely event there are less than 15 people booked on your tour date, we will endeavour to reduce any disruption to your holiday and try to operate your tour with lower passenger numbers. If we are not able to operate your departure date, then you may be asked to change to a different date and a full refund will be made available to you should this alternative not be suitable. This is a fully escorted tour, meaning that you will be met on arrival and will have a guide with you for the duration of your trip, ensuring that you have first-hand knowledge at all times. The currency in Finland is the Euro (EUR). The currency in Sweden is the Swedish Krona (SEK). The currency in Norway is the Norwegian Krone (NOK). We recommend that you exchange your currency before you leave the UK. Cash machines will also be available throughout the tour in order to withdraw money in the local currency. You will need to take money with you to cover any personal purchases such as souvenirs, laundry and extra drinks and snacks. Approximately £450 - £550 per person will be sufficient for the duration of the tour. The order of events and sightseeing may vary according to local conditions or for operational purposes. For this reason, we have indicated approximate times only. Your local guide will inform you of any schedule changes as they are informed of them. Some road construction and/or weather conditions may lengthen the driving times or sailing conditions. Our intention is to adhere to the day-to-day itinerary as printed; however order of events and sightseeing may vary according to the local conditions. 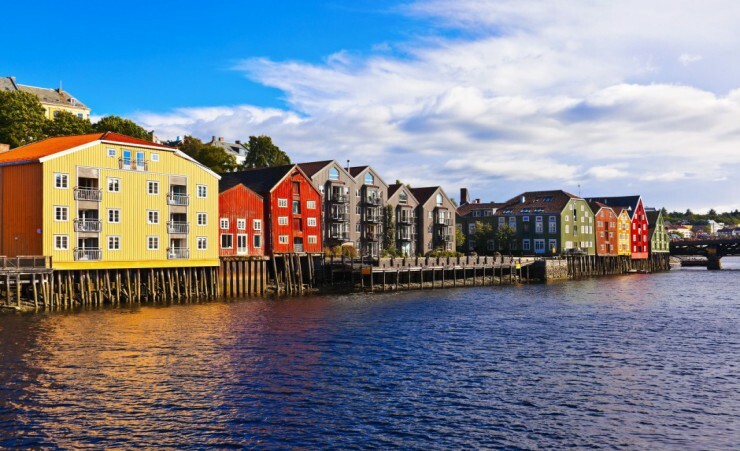 Enjoy the charming waterside cafes, colourful buildings and historic sites of Norway?s third largest city.